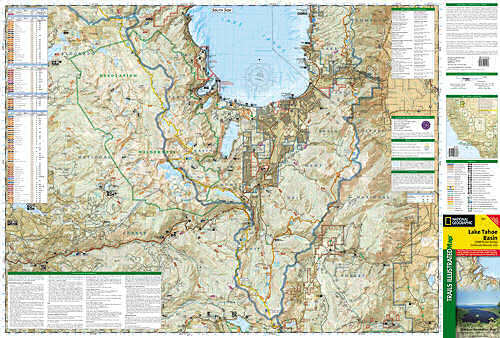 Trails Illustrated Lake Tahoe Basin [ti803] - $9.95 : Trail Explorers Outpost, Keeping the Adventure Alive! Trails are classified by use - hiking, horse and hike, mountain bike, shared use, or motorized - and includes a trail chart showing trail name, location, and allowed use. Trail mileage, private land designation, and information on general regulations, safety, Desolation Wilderness, camping, fishing, and snow parks round out the usefulness of this map. 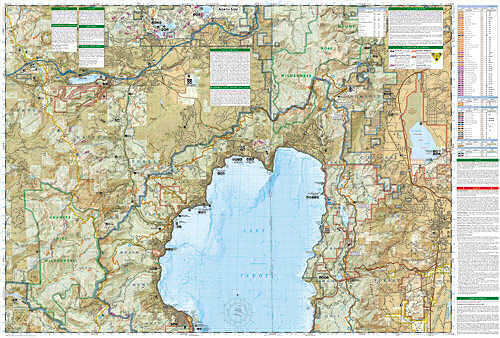 It also includes bathymetric shading of the Lake Tahoe. Coverage includes Lake Tahoe Basin Management Unit, Eldorado, Humboldt-Toiyabe and Tahoe national forests. Desolation, Granite Chief and Mt. Rose Wilderness Areas. Pacific Crest National Scenic Trail. Tahoe Rim Trail. Rubicon OHV Trail. Emerald Bay, D.L. Bliss, Ed Z'Berg Sugar Pine, Burton Creek, Donner Memorial, Lake Tahoe Nevada, and Washoe Lake state parks. Mt. Tallac, Echo Summit, Carson Pass, Spooner Summit, Mt. Rose Summit, Brockway Summit. Towns: Truckee, Tahoe City, Homewood, Tahoma, South Lake Tahoe, Zephyr Cove, Incline Village, Kings Beach, Carson City. Includes UTM grids for use with your GPS unit and a trail mileage matrix.